The 142nd Annual Westminster Kennel Club Dog Show came to a close earlier this week after two days of prestigious competition. Beautiful and talented dogs from all across the world came together in New York in order to compete for best in show. The Westminster finalists are by definition some of the most well-groomed dogs in the world, and we have some of their best tips to share with you today! “Snoods” are a common hair styling tool for women, combining the words “scarf” and “hood” to describe its usage. Snoods are commonly used in professional dog grooming in order to prevent static and keep things clean around a dog’s freshly cleaned head region. They’re also a great tool for drying off your pups head and body regions! … Or Add Some Oils In! Some dogs, such as silkier terriers, may need extra oils added back into their skin to help keep their delicate hair fresh. If puppy hair oil sounds a little too “extra” for your dog, consider adding more oil-rich foods to their diet to help natural production. Small amounts of egg and fish are great for keeping hair soft! What’s important to remember is that each dog has specific needs depending on their breed and coat type. Even if you don’t know your pup’s breed, you can get an idea of their fur type through washing and brushing. Be conscious of your dog’s individual needs before trying any new bathing routines! 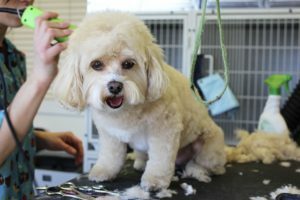 If you want your furry friend to be groomed like a TOP DOG, come in and pamper him with one of our Doggie Spa Packages! We guarantee your pup will feel like royalty after their luxurious bath and complimentary treats. Call today or stop by to make your appointment. How do you get rid of tear stains? Unfortunately, there isn’t one answer for everyone when it comes to tear stains. I recommend following this link and reading through the possible causes to make sure you’re giving your pup the most appropriate treatment for their needs: http://www.leospetcare.com/a-veterinary-guide-to-tear-stains/. Top Dog is an upscale doggie boutique with an on-site bakery making fresh "made to order" birthday cakes, K9 Cupcakes & more. Grooming & Doggie Day Care too!! Near the pier and the dog beach!